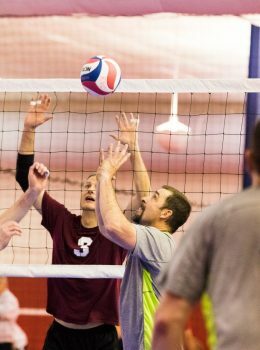 Our largest adult program boasts over 1800 players and offers a competitive 10-week season four times a year (January, March, June, September) for men, women, and co-ed teams. With six different levels of play on Sunday-Friday nights there are opportunities for everyone to get involved. In additional to an RVC membership, there is also a team fee. Team fees are assigned to players by the team captain and typically cost a player between $50-$80 for the season. Your cost is usually dependent on the number of players on your team roster that team fee is being divided between. With some many different levels of experience, skills, and abilities, it can be difficult to figure out what league would be the best. Below is a general description of what a player looks like at each level. A C level player is a beginner. This “recreational” player should know the basics of volleyball and have some volleyball experience. Player is just beginning to bump, set, and spike. A “B” player is still in the early learning stages of the game but knows the skills. They know how to bump, is developing setting skills, and can spike. “B” players often makes mistakes and has a lot of practice yet to go to apply these skills consistently. They have usually played in an organized recreational league and has played more than gym class or backyard volleyball. A “BB” player always knows where to be on the court and when plays are developing, and where to be when the opponent is hitting. “BB” player s know the footwork and how to effectively approach hitting and are usually familiar with playing in a 6-2 or 5-1 system and have played the sport in high school or at a high school level. An “A” player knows the skills but cannot yet execute high-level plays consistently. They can run combination plays in a basic way if passes are good. 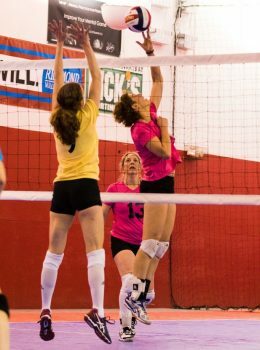 “A” players are experienced playing organized volleyball and usually has played some college volleyball or college club volleyball. An “AA” player performs all skills routinely with little effort. They can run complex systems very effectively and are experts of the game and usually have played at a college or university or has high level tournament experience. An “Open” player performs at the highest level and is considered an expert of the sport. “They are a top player at a college/university, have played professionally, and/or are a top tournament player. If you don’t already have a team to join, it’s best to sign up as a Free Agent so that team captains can connect with you. You can also check the list of teams looking for players and connect with a team captain that way. You do not need to have a membership to list yourself as a free agent and can wait until after a team has added you to their roster to join. If you are unable to find a team for the upcoming season, another option is to join our Starter League where you can learn more about RVC culture and our Adult League and meet new people to hopefully form a team for next season. 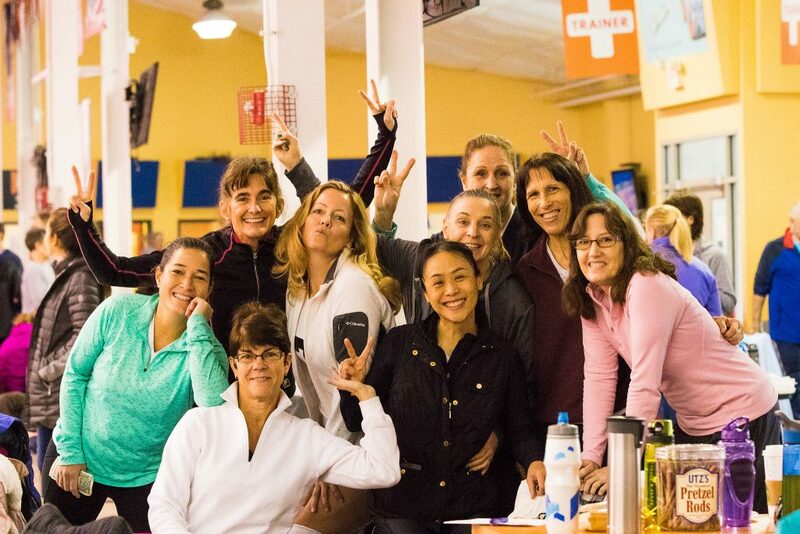 Not only do we want to foster an atmosphere for friendly competition and athleticism, but also a place where people can be social and connect with each other in a fun, welcoming environment. The cafe offers over 10 different beers on tap, along with great food options such as pizza, burgers, fries, sandwiches, and wings. Drink specials happen almost nightly, and players love to stick around before and after their matches to hang out, enjoy our patio space where dogs are welcome in the summer and where firepits are set up when it gets cold out, or our game room which offers darts, foosball, giant jenga, and more. Existing member logging in for the first time or forgot your password? 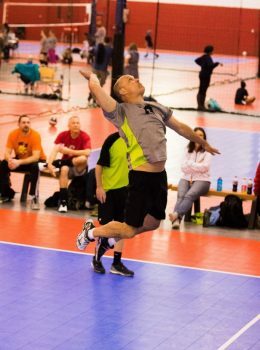 The Richmond Volleyball Club is dedicated to providing a lifetime of opportunity through the sport of volleyball by promoting interest in the sport, teaching and developing skills and techniques, and fostering teamwork, sportsmanship, and an appreciation for health and wellness. © Copyright 2015 Richmond Volleyball Club. All rights reserved.